You may not believe that cleaning dryer vents is a priority, but statistics show otherwise. In fact, more than 15,000 home fires are caused by clogged dryer vents each year. These fires can almost always be prevented with regular cleaning, and by replacing old vents with newer models on a regular basis. Here is a look at what you need to know to keep your dryer vent clean and your home safe from a fire hazard. What Is That Hose/Pipe Thing? Your dryer works by blowing heated air through a tumbling basket, which holds your wet clothes, but that heated air needs to go somewhere after it has removed the moisture from your clothes and towels. Where it goes is outside, through a long vent from the back of your dryer to the exterior of your home. Most homes use flexible vinyl, plastic or metal tubes that look like an accordion to channel the air to the outside. 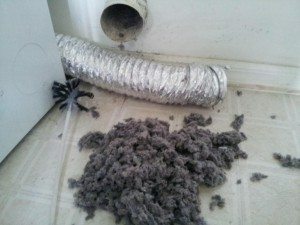 Dryer vents have been made for decades with ridges, which trap the lint that escapes from your dryer along with the heated air. Each of the ridges acts as a speed bump as the air travels through it. According to the U.S. Consumer Product Safety Council, fires happen when the lint builds up in the nooks and crannies of these old hoses. Trapped lint blocks the air from successive dryer loads, leading to heat buildup and possibly fires. Experts now recommend replacing this accordion-style ductwork with a hose that is rigid or semi-rigid and smooth. This style allows the maximum amount of air to blow freely through the duct. Older vents, both in design and material, allow the lint to become trapped more easily. They also are more prone to getting kinks and to being crushed. All of this reduces the airflow and leads to fires. The good news is that the new vents are fairly cheap, easy to find and not difficult to install. If you are comfortable with a screwdriver and can follow illustrated instructions available online, you should be able to change the vent yourself. Before you start, measure your old duct. Most are 4 inches in diameter, but there are variations. Next, check the current pathway of the vent so you know how long of a section to buy. How yours goes on depends on the model, the vent hose itself and the style of hose clamp. Although they’re better than the old-style vents, the new ones still need to be cleaned regularly. Experts recommend cleaning or replacing yours at least once a year, and more often if you use your dryer often. You can purchase cleaning kits with long, flexible brushes that remove the lint, but if you are still using a ridged vent, consider having your vent cleaning done by professionals. Appliance repair companies have tools made specially to get the lint out from the crevices. If you try it yourself on a vent that hasn’t been cleaned in a long time, you can easily compact the lint that is in the hose, making the problem worse. Even better, consider upgrading your old accordion-style dryer vent to newer smooth type, making regular lint removal a breeze. 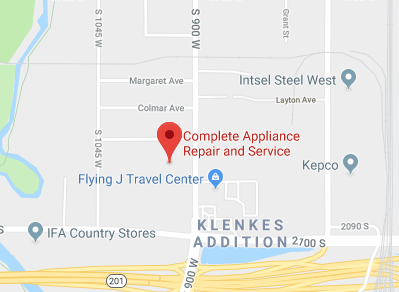 In and around Bountiful, Utah, Complete Appliance Repair provides a full range of appliance repair services, including clothes dryer sales, installation, repair and maintenance. Don’t risk this common house fire danger. Contact Complete Appliance today for help with cleaning dryer vents in your home. This entry was posted in Blog and tagged Cleaning Dryer Vents, Dryer Maintenance on July 23, 2015 by admin.